The Texas chrysotype process offers the printer a simple and repeatable way to make gold prints of extraordinary beauty. You need only add a few drops of ascorbate to 40% ammonium ferric oxalate (AFO), mix with an equal volume of 10% gold, and brush the solution onto a sheet of suitable paper. You expose the coated paper to UV light and examine the progress of the image, choosing the exact moment to stop further printing out. Identical prints can be made quickly and effortlessly. The following 100 step transmission wedge provides a different perspective on the Texas chrysotype scale. The first clear distinction above the base black occurs at 49%. Detail is just visible at 42%. The final step with any detail (a few small dots, not visible in scan) occurs at 4%. The range shown in the above charts is well represented in the following print of the Alamo at night. 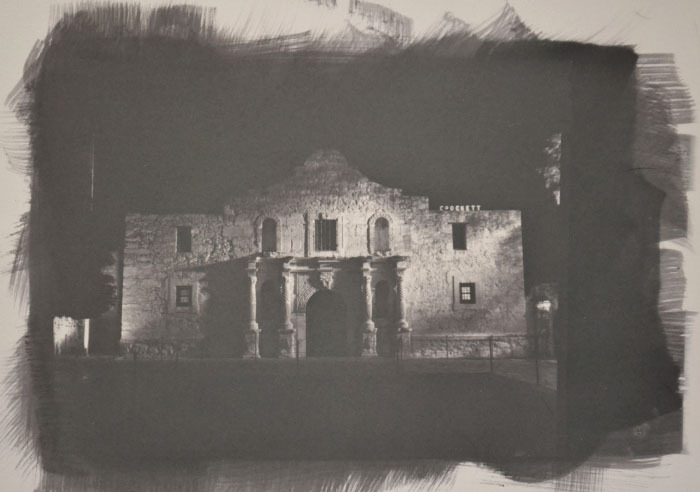 This image exhibits a full range of steps from the empty black of the night sky through the various grays on to the direct light sources of the lamp in front of the Alamo and the neon sign "Crockett" peering over the right edge of the facade. With no dodging and burning, the gold image takes full advantage of the off-white Arches Platine on which it is printed. The limiting factor to the tonal scale is the paper itself rather than the process. The critical limitation of printing with gold is its inherent contrast. After his experiments in 1842, Herschel declared gold an unsuitable medium for continuous tone images. Even recent developments in printing with gold have failed fully to tame gold's contrast. The Texas chrysotype process overcomes this limitation through what amounts to the chemical introduction of base fog. With only two compounds needed to print a crude chrysotype -- light-sensitive AFO and inert gold chloride -- it is obvious even to the non-chemist which of the two must be modified. However, until now, no one has been able to discern how AFO must be altered. The key lies in a limitation of AFO itself: the compound's gradual decay from ferric iron to ferrous iron. As a solution of 40% AFO ages, prints made with it lose contrast. By convention, at the point loss of contrast becomes evident, the printer either discards the remaining solution or, if economy-minded, adds a few drops of hydrogen peroxide to restore it, at least for a few more prints. The peroxide releases oxygen atoms which attach to and convert at least some of the ferrous iron back to its ferric state. The Texas chrysotype process turns convention on its head by artificially aging AFO. Gold's contrast is tamed in the magical compound and, quite incidentally, gold can be fully printed out with no pre-humidification of paper. The discovery of the Texas chrysotype formula arose from an unusual set of circumstances -- an alignment of the stars, as it were. An extremely hot summer in Central Texas, combined with a faulty switch on an HVAC unit together resulted in the author's forced tolerance of a quite hot home interior that prematurely decayed a fresh batch of 25ml of 40% AFO. Unaware of the state of decay of the solution and inspired by a heat-driven dream of molten iron and molten gold flowing together to create an alchemical solution, the author attempted to print a chrysotype even though the small brown bottles of AFO and gold chloride were hot to the touch. Amazingly, an exquisite image printed out: the first Texas chrysotype. That the above lacks contrast and Dmax was irrelevant at the time. After several months of (unsuccessfully) trying to produce a Chrysotype S print, any photographic image was welcome! The process has two limitations. First, contrast control requires several variations on the traditional AFO solution to be prepared in advance, each with a different number of drops of ascorbate. Second, strenghtening Dmax requires the trade off of rougher transitions in midtones and more grain (unless you use an ammonium dichromate bath, in which case smooth tonal transitions and fine grain are preserved). Prints develop out slightly (about 1/3 stop darker) in water or acid at room temperature. They do not develop out at all on immersion in very cold acid or water, but still darken slightly on drying down. In either case, lower contrast prints made with AFO to which 5 or 6 drops of ascorbate have been added usually take on a lavender hue when immersed first in a mild (5%) citric acid. Boric acid in a stronger solution (~40%) produces blue tones. Boric acid is inexpensive, widely available, and not terribly toxic. Existing documentation states that an initial tartaric acid bath produces red tones with chrysotypes, though this has not been confirmed with the Texas Chrysotype process. Use Revere Platinum 145 gsm paper. Pre-wet the paper with a very wet brush and allow any puddled water to soak in. When the paper is still wet enough to glisten when viewed at an angle in direct light, brush on the AFO/gold solution. Allow the paper to dry until no longer damp, but still very humidified. Expose to UV light, removing when desired print-out is reached. Executions, the Presidio, Goliad, Texas. 5.25 minute exposure under six Feit 13W UV CFL bulbs. The minimum materials required for the Texas Chrysotype process are the generic tools used for virtually all alternative processes. For the sake of thoroughness, they are listed below, with comments as appropriate. The recommended best practice for beginners is to start printing chrysotypes with Arches Platine. This superb paper provides the beginning chrysotype printer immediate gratification (especially if you work with a printing frame that lets you drop half of the back to view print-out progress). After the first pricey package of Arches Platine, you will want either to switch to the inexpensive vellums or to experiment with sizing the far cheaper Arches Aquarelle (less than half the price of Platine). Superb results, better than Platine affords, are obtained with Aquarelle by preparing a 2% to 3% solution of arrowroot starch, immersing the paper fully in the solution (after it cools to room temperature) and leaving the paper in the starch for 30 minutes. Hang the paper to dry thoroughly, then re-immerse the fully dry paper in the starch. Hang to dry by the opposite corner from the first coating. Allow the paper to dry overnight before printing. The same process works with Revere Platinum 300 gsm. Note: Gelatin sizing did not work with any paper, and online research suggests gelatin is incompatible with gold. If you are interested in a special effect, such as printing on translucent paper and backing the paper with gold foil, use Clearprint or Pacific Arts vellum. Note that vellum puckers severely when wet and achieving a sharp print requires careful attention to ensuring paper flatness during printing. Note: Vellum papers in general should work provided they are 100% pure cotton fiber; other vellum papers, such as Canson Vidalon, may fall apart during the long washes. Stir 20 grams arrowroot starch into one liter cool distilled water. Stir vigorously while slowing heating the solution to a boil. You want to dissolve all solid particles rapidly and avoid clumping. Lower heat once solution reaches full boil to avoid overflow from the pan. Continue stirring until the solution is clear and you observe no solid particles suspended in solution. It will still look milky, but you should be able to discern the stirring spoon at the bottom of the pan. Continue boiling for at least another five minutes after you are sure the solution is clear enough. Remove from heat and allow the solution to cool to room temperature. Mark the back of paper to be sized with a pencil. Immerse one sheet of paper into the solution and leave it immersed for 30 minutes (more than one sheet if you have a sufficiently large tray). Remove the paper from the solution by one corner and hang to dry fully (typically several hours). You can repeat the above steps 6-8 for additional sheets of paper while drying. When the sheet is quite dry, repeat steps 6-8. Hang the paper to dry by the opposite corner from which you previously hung it. Allow to dry fully before using. For the recommended 3% solution for sizing Revere Platinum 300 gsm paper, dissolve 30 grams of arrowroot starch in one liter of cool distilled water. Otherwise, steps 2-12 above are identical. In addition to gold chloride and ascorbate you need to make the standard solution for printing and clearing the Texas Chrysotype. For each additional 10 ml of AFO solution, add 4 grams of crystals and 10 ml distilled water. A few ml of 1% ascorbate will treat quite a large volume of AFO. All chemicals are readily available on line (Bostick & Sullivan, Digital Truth, Artcraft Chemicals, Photographers Formulary, Freestyle, etc.). Ascorbate can be purchased at most health food stores as well as many pharmacies. Boric acid is widely available at grocery stores and is also the ingredient in Roach Pruf. For reference, a given solution in percentage expresses the number of grams of the dry chemical to dissolve in 100ml of distilled water. (You dissolve the measured weight of the dry chemical in a volume approximately 75% the final volume and top off the solution.) 40 grams of a chemical dissolved in water to make up a 100 ml solution would be 40% and 4 grams added to 100 ml a 4% solution. Important: Carry out all work with AFO in crystal or liquid form in tungsten (not fluorescent) light, at a maximum illumination of 60 watts at least six feet away. 5 grams Citric acid, if printing on Arches Platine. Dissolve 5 g in 1 liter water. 5 grams Tetrasodium EDTA, if printing on other papers. Dissolve 5 g in 1 liter water. Wear nitrile or rubber gloves. Phosphoric acid (Lime Away is a very expensive alternative) for developing out accidentally underexposed image. Wear nitrile or rubber gloves. Oxalic acid for developing out slightly with more contrast. Wear nitrile or rubber gloves. Ammonium dichromate for first bath to add "snap" to a flat print. Wear nitrile or rubber gloves. The savings obtained in buying gold chloride and dissolving it are negligible, given that most of the cost of gold lies in the metal's intrinsic value. Ascorbate is fairly inexpensive in crystal form, as is AFO. You will absolutely have to mix some of the chemicals yourself, such as Tetrasodium EDTA and citric acid, so bite the bullet and purchase a scale. A $20 digital scale purchased off Ebay will quickly pay for itself in savings. Just be sure your scale can measure weights at least as small as .5 gram. Otherwise, you may find yourself mixing up volumes in terms of liters rather than 10 ml or 50 ml. Handle AFO only in tungsten (not fluorescent) light. Maximum intensity is 60 watts and light should be at least 6 feet distant from the AFO. Dissolve .5 mg ascorbate in 50 ml distilled water (or just .1 in 10 ml if your scale permits). Store in a bottle labeled C.
Dissolve 12 grams of AFO in 25 ml distilled water. Top off to 30 ml. Prepare three adhesive labels and apply them to the three small brown glass bottles, one AFO+6, one AFO+8, and one AFO+10. Pour 10 ml of AFO solution into each of three separate brown glass bottles with eyedropper caps. Add 6 drops of ascorbate to the bottle labeled AFO+6. Agitate vigorously for a few seconds. This is your low contrast solution. Use this for printing very contrasty negatives. Add 8 drops of ascorbate to the bottle labeled AFO+8. Agitate vigorously for a few seconds. This is your normal contrast solution. 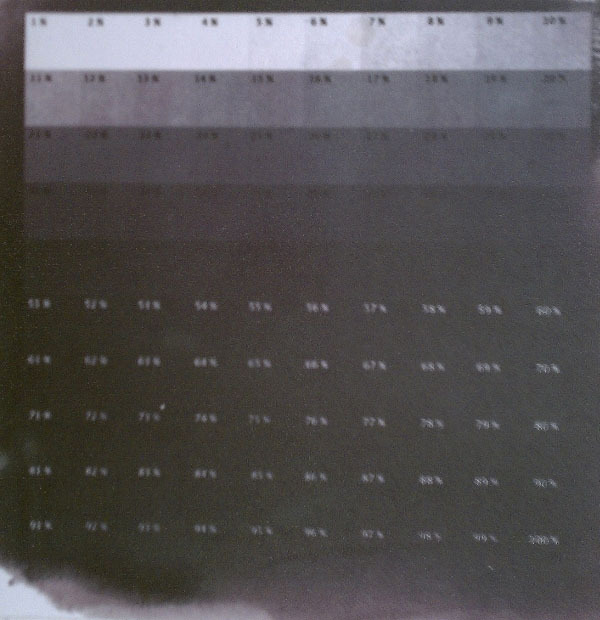 Use this for printing normal contrast negatives. Add 10 drops of ascorbate to the bottle labeled AFO+10. Agitate vigorously for a few seconds. This is your high contrast solution. Use this for printing soft negatives or for negatives that require a boost of Dmax. Pre-wet paper with a wet brush and allow any puddles of water to be absorbed. Apply the AFO and gold solution with a slightly damp brush. Allow to dry only until the surface is just barely damp. If contrast boost is needed, immerse in 10% ammonium dichromate. For 10 or more drops of ascorbate added to the AFO, you will have to brush the gold and AFO solution onto the paper as quickly as possible after pouring it; otherwise, your print may suffer deep stains where the drops of AFO/gold sank in quickly. Fine art contact papers have a smooth side and a rough side. If you are not able to distinguish the difference visibly, you can feel the paper. (Make sure your fingers are clean and dry!) For chrysotypes, apply the emulsion to the smooth side. The rougher side of paper will absorb excessive gold and AFO, resulting in an unsatisfactory image. When calculating exposure, be aware that the print will typically darken by about one third stop after it has completely dried. Print approximately one third stop lighter than the desired density of the final print. Important: Carry out all work from step 3 through step 15, below, in tungsten (not fluorescent) light, at a maximum illumination of 60 watts at least six feet away. Wear nitrile or rubber gloves. 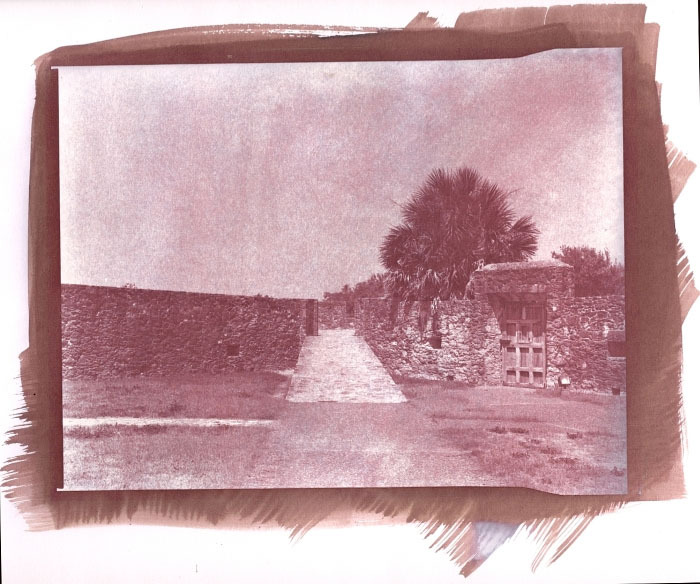 Place an undeveloped negative or matte on the smooth surface of a sheet of paper. With a pencil, trace a light outline of the negative on the paper. Wash the application brush thoroughly under running water. Wearing gloves, hold a heavy paper towel in one hand and wipe the brush damp with the paper towel. If you are particularly obsessive about dust (and animal hairs, if you keep pets), draw both sides of the brush across a sheet of scrap paper. Place the brush aside, close at hand. Count out the appropriate number of drops of AFO into a shot glass (approximately 6 drops for a 5x7 negative, 12 for an 8x10). Add to that an equal volume of the gold solution. Swirl vigorously for a few seconds. Pour the solution along the narrow edge of the negative outline, inside the pencil lines. Immediately brush the liquid across the full length of the outline. Brush steadily, confidently and deliberately – neither rapidly, nor too slowly. Continue until you have spread the solution evenly across the paper. If dust specks or animal hairs are transferred onto the paper from the brush, flick them away with a gloved fingertip and brush to smooth out the spot. If you are using a UV lamp box, turn on the lamps to warm up about five minutes before the print is ready. The print is ready when the surface is just dry and not damp. Place the paper emulsion side (yellow) up in your contact print frame. Place a 2 or 3 mil sheet of acetate/mylar on the paper covering the coated area. This sheet is necessary to protect the negative from serious damage. Do not deceive yourself that the paper is sufficiently dry not to damage the negative. The heat from the UV bulbs can generate an AFO steam, from an apparently dry sheet of paper, that settles between the acetate/mylar sheet and the negative and subsequently corrodes the emulsion. I have had two negatives ruined this way. Place the negative to be printed face down onto the acetate/mylar sheet and close the frame. Place the print frame in direct sunlight or in the UV lamp box. When you have determined the exposure, slide the paper face down into a tray of very cold water. (If you have cooled the water by adding ice cubes, be careful not to let any ice come into contact with the emulsion area.) Agitate gently for ten minutes. 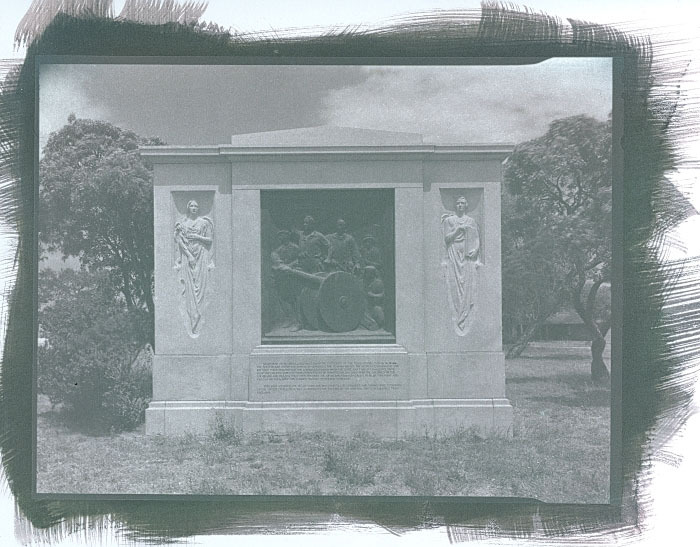 If the image is slightly underexposed (1/2 to 2/3 stop), slide the paper face up into a tray with warm (~85° F) 5% citric acid to cover the print. Agitate gently until the print reaches the desired density. Remove print from the citric acid (or EDTA) and immerse it in cool running water for five minutes. Remove the print from the water and immerse it in a standard strength solution of Hypo Clear or other sodium sulfite solution. Agitate gently for fifteen minutes. Remove the print from the sulfite and immerse it in cool running water for five minutes. Wash in running cool water for one hour, unless you have printed on vellum in which case wash for 30 minutes. Hold the print by one corner to drain off the excess water. Place the print flat on blotter paper to dry. You will certainly have unsatisfactory results at some point. It is inevitable. This section identifies the commonest problems and provides solutions for resolving those problems. Problem: Prints consistently darken too much on immersion into first bath. Solution: Use ice cold water for the first clearing bath or reduce exposure time by about 10%. Problem: Print accidentally underexposed (too light) approximately one-half to one stop. Solution: Immerse print in a warm bath (~95° F) of 18% phosphoric acid. Lime Away mixed with 50% water is an adequate substitute. Place tray under an overhead fan hood. Do not inhale the fumes. Wear a respirator if necessary. Note: Substitute a 40% solution of boric acid for the phosphoric if you do not object to a blue print. The boric acid is considerably less noxious. Problem: Print severely underexposed approximately one and one-half to two stops on removal from print frame. Solution : Immerse print into a hot bath (~130° F) of 18% phosphoric acid. Lime Away with 50% water is an adequate substitute. Place tray under an overhead fan hood. Do not inhale the fumes. Wear a respirator if necessary. Note: You can substitute a 40% solution of boric acid for the phosphoric if you do not mind a blue print. The boric acid is considerably less noxious. Solution: Try immersing the print in a 5% solution of oxalic acid at room temperature. This rarely yields a satisfactory print, but I have successfully lightened a few prints with this method. Solution: Grain is caused by either of excess ascorbate in the AFO or an excessively wet brush. The brush should be just damp enough to prevent excessive absorption of solution. If a wet brush is not the cause of the grain, reprint with a solution of one or two drops fewer 1% ascorbate added to the 40% AFO. 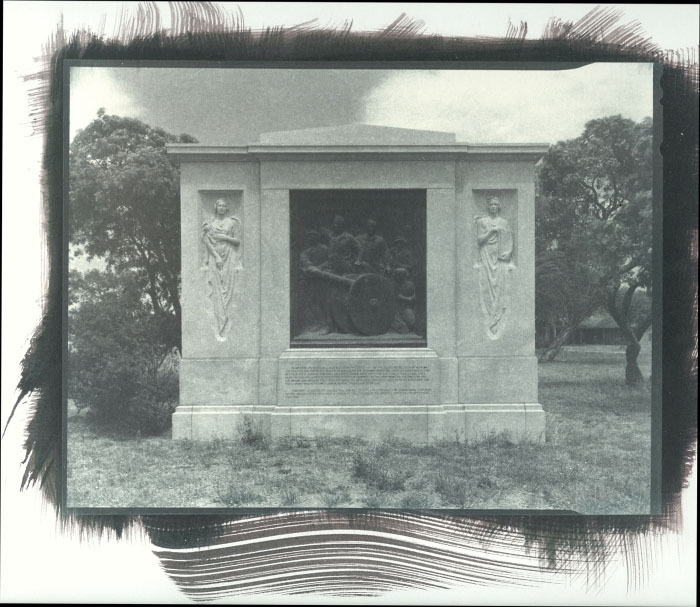 Solution: If you identify the weak Dmax on removing the print from the frame, immerse the print in a warm solution of 10% ammonium dichromate. Caution: Wear rubber or nitrile gloves at all times when working with dichromate. Otherwise, if the image fails to print or develop out with adequate Dmax, reprint with 40% AFO with 2 drops more of ascorbate solution added (unless you are already using AFO with 10 drops ascorbate per 10 ml). 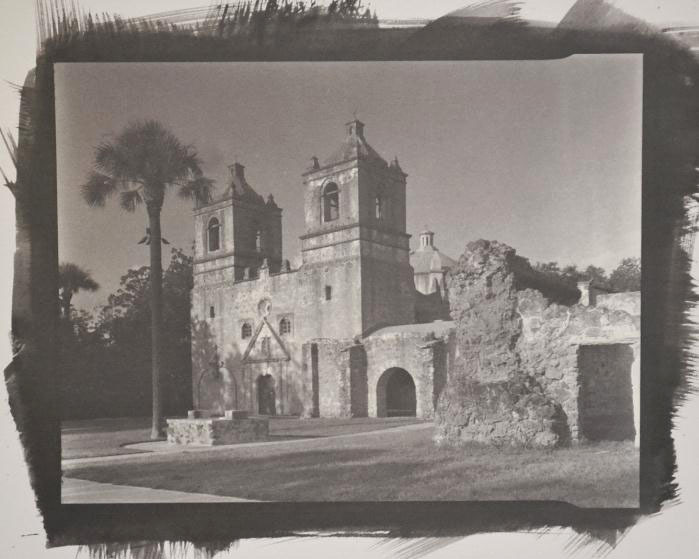 As a last resort, you can try grossly underexposing a print made with that negative and developing it out in very hot boric acid. See the instructions for making a blue print, above under Colors. Finally, reprint with a solution of one or two drops more 1% ascorbate added to the 40% AFO. If none of these solutions work, try printing with vellum paper. Problem: Print red, grainy and contrasty. Solution: Your brush was too wet, or you are using a light-weight paper. Use a damp, not wet, brush. Better yet, switch to Arches Platine or a paper sized heavily with starch. Problem: Print contrast too low on removal from frame. Solution: Develop out for 1 to 5 minutes in a 10% solution of ammonium dichromate at room temperature. Problem: Print highlights yellow after processing. Solution: Immerse the print in a 5% solution of oxalic acid until highlights clear. The principles for retouching chrysotypes are the same as those for retouching silver, platinum and palladium prints: Retouch as little as possible; retouch using the smallest tool points possible; retouch the smallest area at a time as possible. For white spots, generally caused by dust particles settling on the print before exposure, you can use either spotting dyes or India ink applied with 000 or 00 brushes. Apply the absolute minimum amount of fluid and slowly build up density in an area within and smaller than the spot (unless it is very small). A 000 brush is strongly recommended. Excess water will at least "crater" a spot, rendering the circumference darker than surrounding gold, and at worst stain the print irreversibly. In other words, less is always more, and the least is the most desired. India ink is available in a variety of colors, including red, blue and violet, which can be mixed to obtain a specific shade. To remove black spots, you need a magnifying glass (preferably stand mounted; otherwise, a third arm is desirable) and a sewing needle or X-Acto blade. While the print is still damp, gently and with great deliberation use the tip of the needle or the blade to break a black spot up into smaller pieces. You will often find you do not need to remove the individual pieces of the original spot after you have broken it apart. If you must, try removing only a piece or two of the broken spot, effectively reducing the overall size of the dark area to imperceptibility. The risk with black spots lies in damaging the surface of the paper, which no retouching will repair. Again, less is always more, and the least is the most desired.